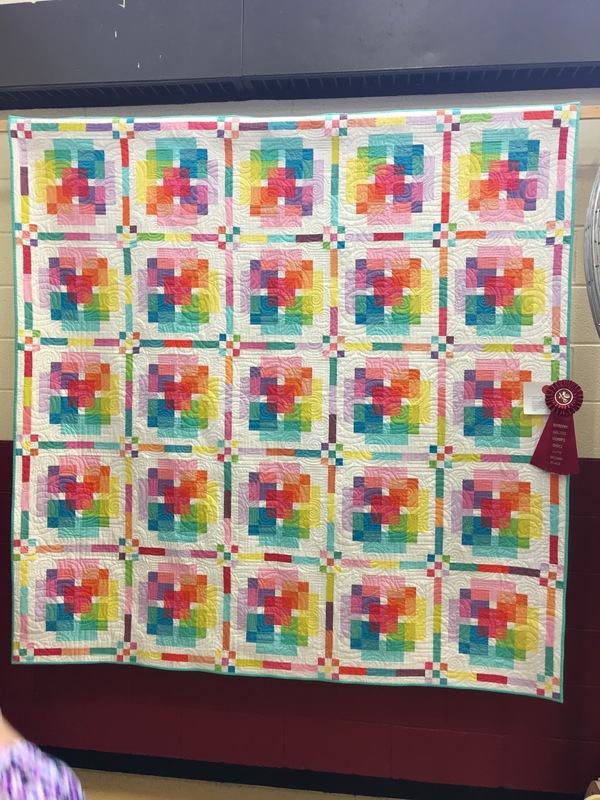 Last time I showed off some ribbons I won from a local quilt show—the Bayberry Quilters of Cape Cod put on this show earlier this month with the theme “Cabins on the Beach.” Now I have attended many, many national shows, and while beautiful, they can get a bit repetitive with the same winners all the time. 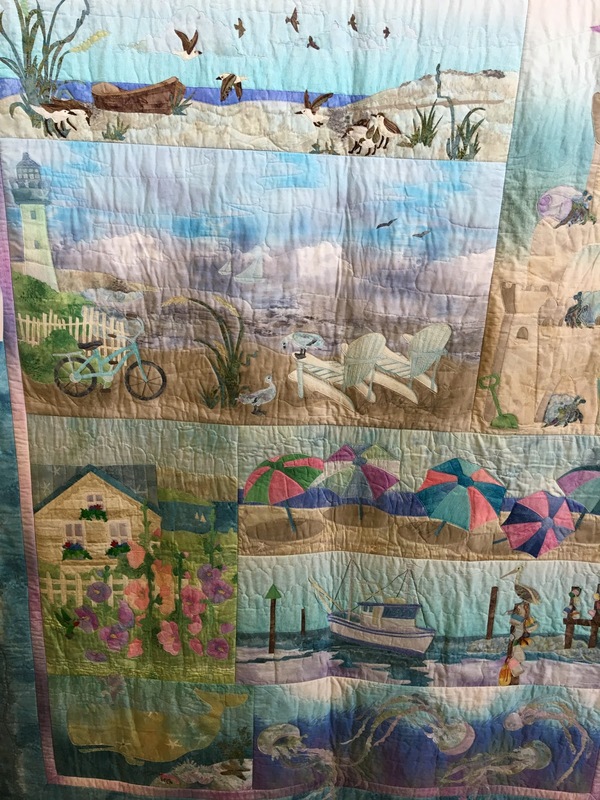 But let me tell you the talent just on Cape Cod is amazing—you may have noticed, artists always pick nice places to congregate, and Cape Cod is full of artists! Judging by the show, quilting is alive and well in this corner of Massachusetts. Here is just a handful of my favorite pieces this year. Let’s start with critters, because in this part of the country, you will find plenty of them! This was one my absolute favorites… an original piece by Cathy Papazian entitled “Salt Marsh Shorebirds.” The birds have wonderful bead eyes and the fabrics are just perfect. 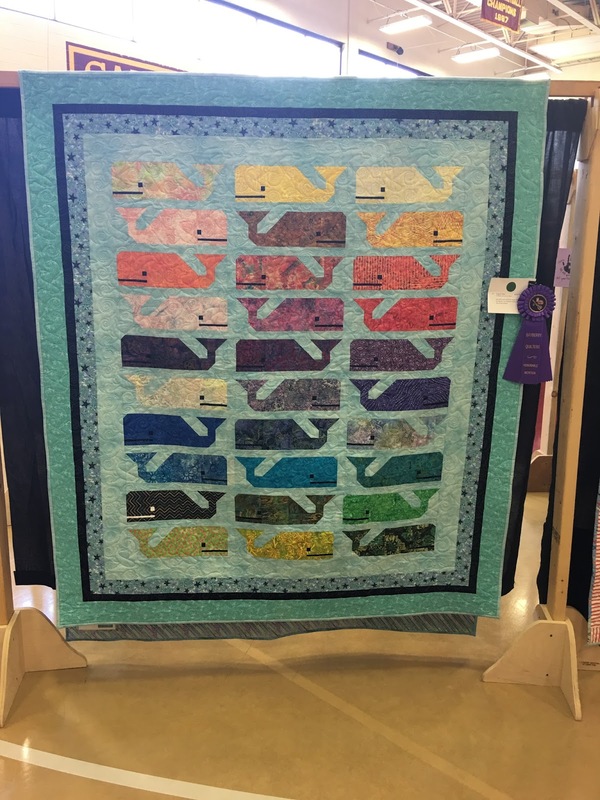 This is one of those animal quilts designed by Elizabeth Hartman—you’ve probably seen the foxes, the bears, bunnies, porcupines—sometimes one has glasses on—this is the first time I’ve seen whales, but I never get tired of them. Her Aviatrix pattern is on my bucket list. This one is stitched by Rada Elegant and called “A Whale of a Good Time” which I am sure is describing the fun she had making it! I looked for a whale with glasses, but didn’t see one. I guess whales aren't as nearsighted as some other creatures seem to be. Lots of critters in this one! This is “Beach Walk” by my friend Tere D’Amato. 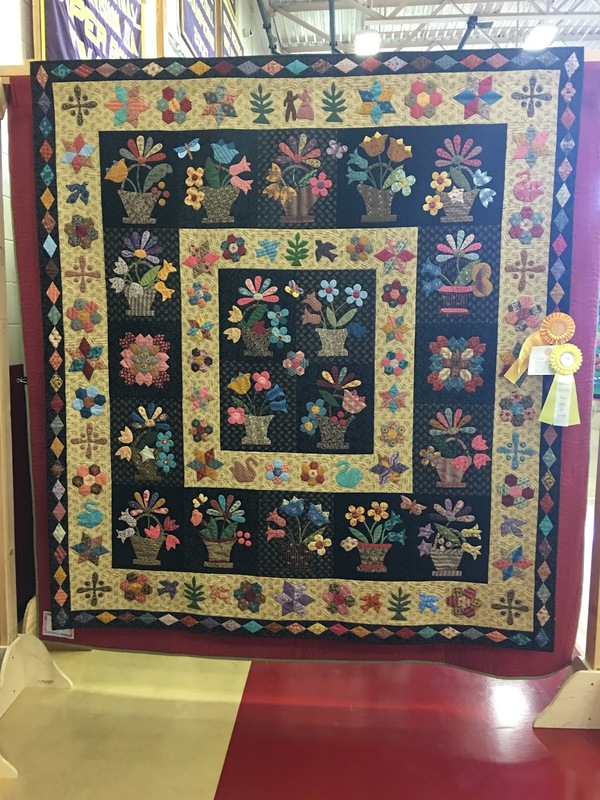 Lately she’s been winning prize money with original work in AQS shows, but in her “formative” years she made this amazing kit! I was the one who encouraged her to enter it—she felt because it wasn’t original, it wasn’t up to snuff. She took a second place—wasn’t I right, AS USUAL. 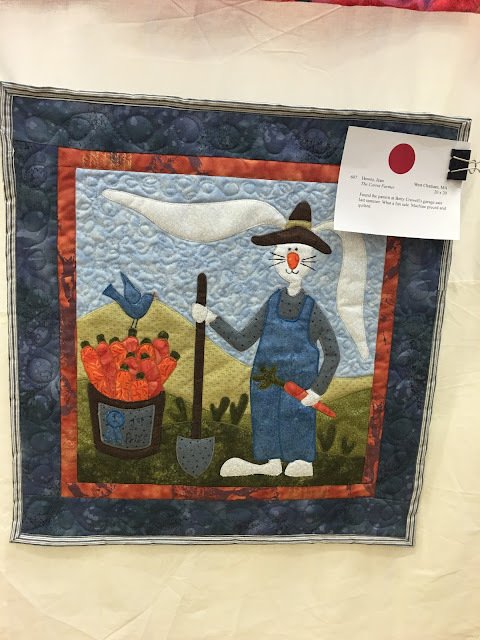 For my last critter quilt fave, I just loved this because after “Easter Sunrise,” it was nice to see someone else had bunnies on the brain! And it was hung right next to mine-- so cute together! It is “The Carrot Farmer” by Jean Howes. Jean—I believe we are soul mates! 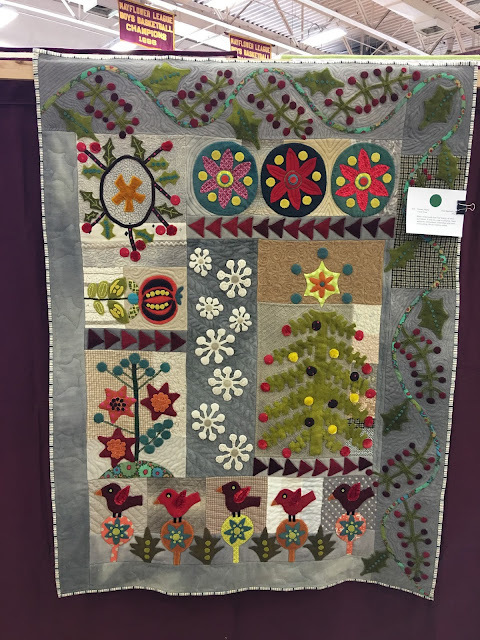 Next up is favorite pieced quilts—I love piecing and I really admire it done well. This is one of the most complicated and beautiful log cabins I’ve ever seen—plus it was huge! This is Carol Salerno’s “Chocolate is Sweet But my Honey is Sweeter.” But I'll be that blue ribbon was pretty sweet, too! A beautiful, modern quilt: Laurie LaConte, “Color Cubes.” Beautiful colors and the quilting was just simple and sensational. I love the transparency and it reminds me of a clear plastic construction toy we had years ago in my family "Play Plax..." Does anyone else remember it? Happy memories. An on to embroidery… I am always lecturing to this group about machine embroidery, and I guess I will have to keep on, because so far there's not a lot out there! 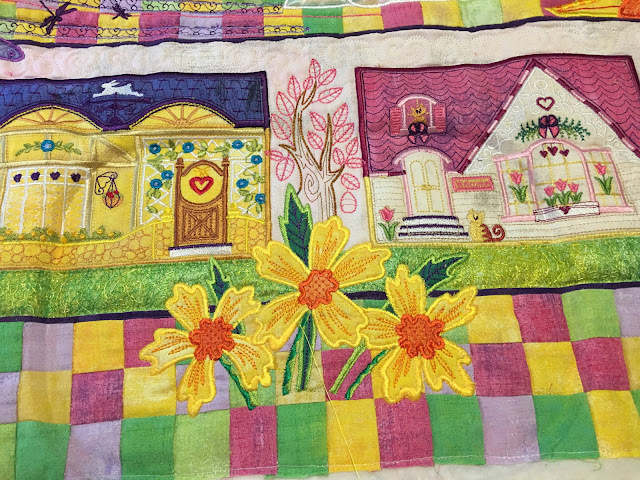 Gorgeous hand applique is where it's at for this group and who can blame them. 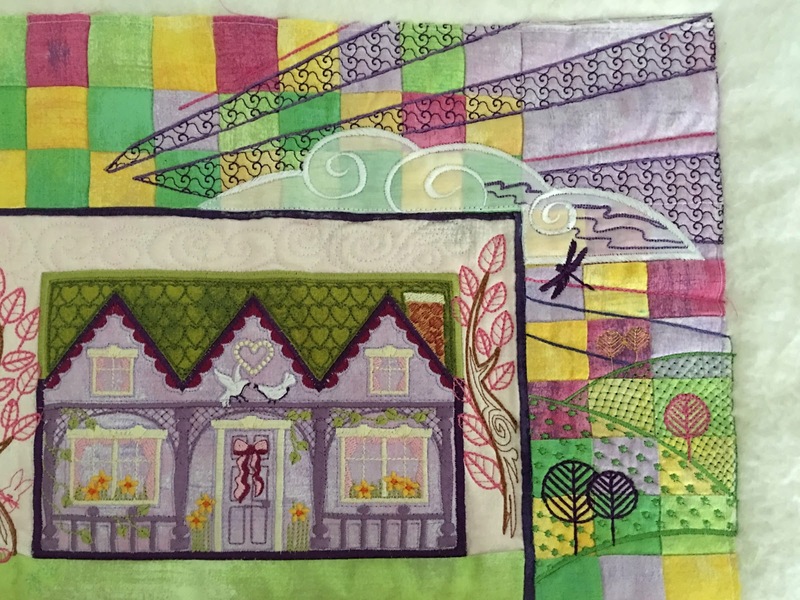 A Sue Spargo block of the month, “Creem Treat” by Gloria Farmer. 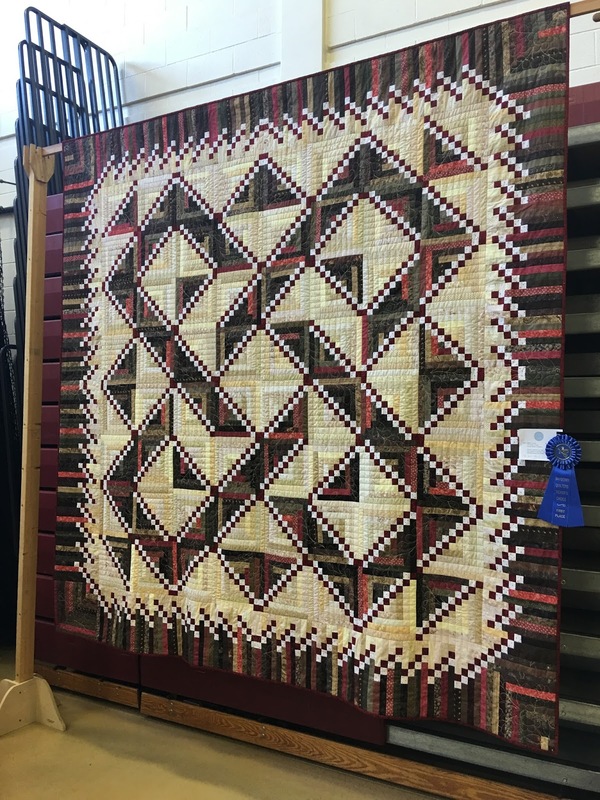 Gorgeous, gorgeous work—it did not get a ribbon, so that tells you something about the level of competition at this show because it was a wonderful piece! One of my personal favorites. 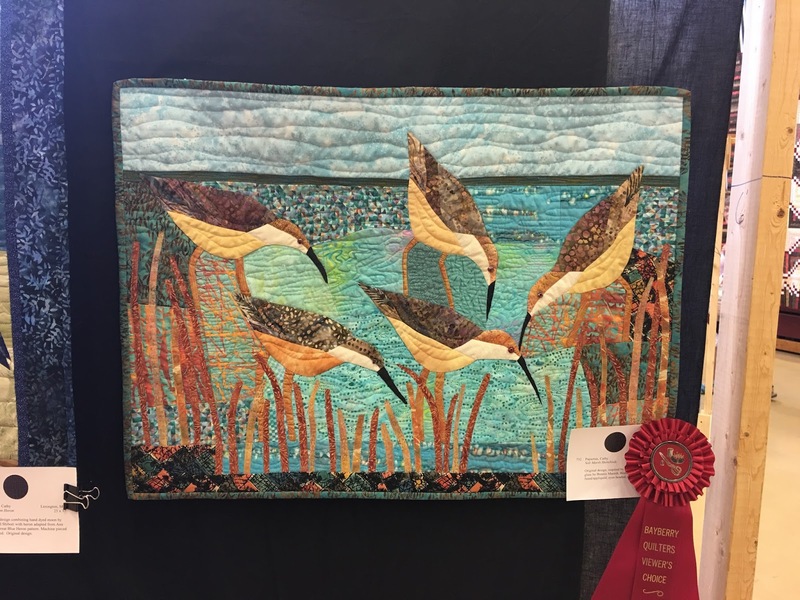 A blue ribbon for handwork! I think that this is an original piece—it is by Audrey Germer entitled “Many Happy Hours.” I think that pretty much describes how we feel when making these things. And this one was many, many, many, many hours, I am sure! 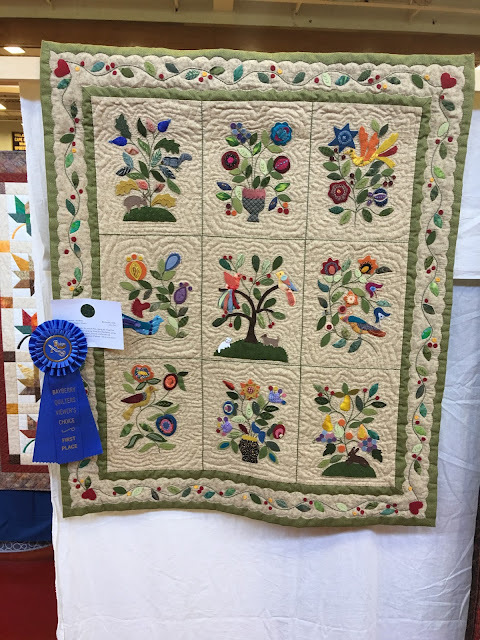 Audrey won a blue ribbon in another category for handwork as well—obviously a very talented, not to mention patient, person. Finally, this was the Best in Show— Anne Messier won for “Folk Art Baskets.” Every year, some amazing hand appliqued quilt wins the day—some year will it be a gorgeous machine embroidered piece? I certainly hope so! "The Making of Easter Sunrise"
If you can have Christmas in July, you can certainly have Easter in August! This is the story of how I finished my sample of the Spring Cottages collection that was for sale last spring. Although machine embroidery is the great love of my life, my roots are in quilting. 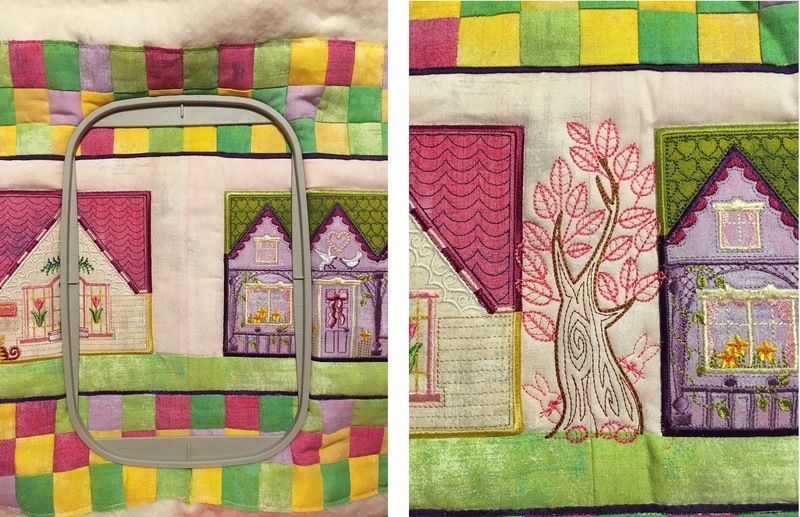 After buying my first embroidery machine in 2002, it was actually a matter of years before the light bulb went off in my head... embroider, then add batting and backing right in the hoop, and you can quilt. I've always wanted to see what a large, fully finished piece of this nature could look like. 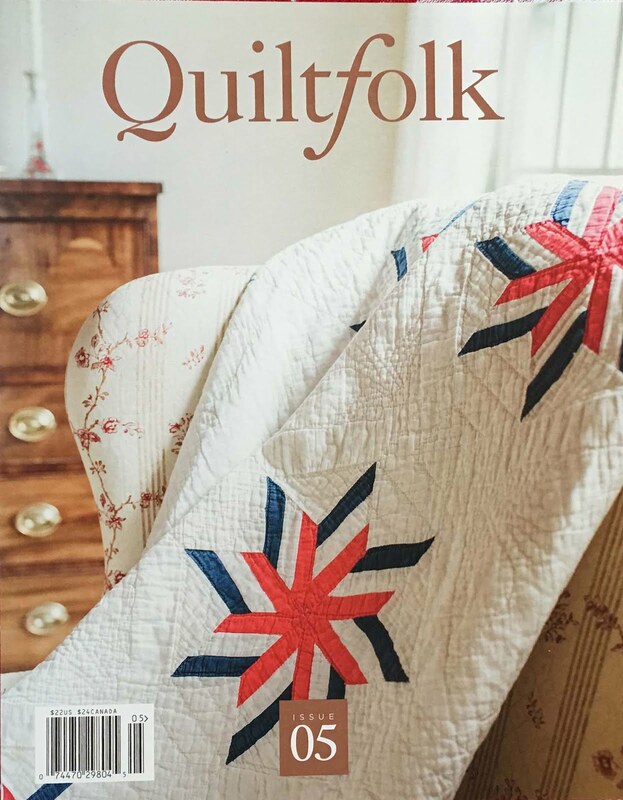 "Computerized" is the next frontier for quilting. First, we hand quilted, then by machine, and longarm; each method had to wait its time for acceptance. The mere word "computerized" implies that some of the artistry has been removed--I'd love to challenge that notion and fully explore the technique. Enter the Spring Cottages. I added a checkered border and pinned it to my design wall with so many other unfinished embroidered pieces. But the creative juices were still flowing. The first thing I did was enter it in a local show a couple of months off-- what more motivation do you need to finish a piece than that! I took a photo, printed it full scale, and did a tracing paper overlay. Starting with some landscaping between the houses, a rising sun and clouds popped up on the horizon. 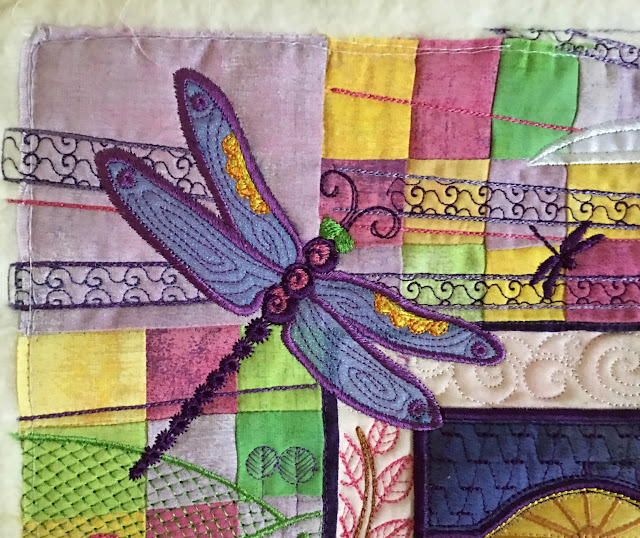 I then added some of my other favorite things: dragonflies, fields and daffodils. And being Easter at the time, it wasn't long before bunnies were hiding eggs in the grass! To prepare for more embroidery, I added three layers of batting-- 2 poly blend and one wool, and a cute Easter Egg backing fabric. Past experience told me that's what I'd need for maximum pouf-- to hold up to thousands of embroidery stitches. Starting with the trees, one by one, I digitized each element, then hooped, and stitched, again and again. Over a matter of weeks in my spare time at night, I digitized each new piece and stitched it on. Sky, then clouds, sun, fields and daffodils. While reading up on quilt shows, I learned that most required a perimeter of 100" or more to move out of the miniature category. 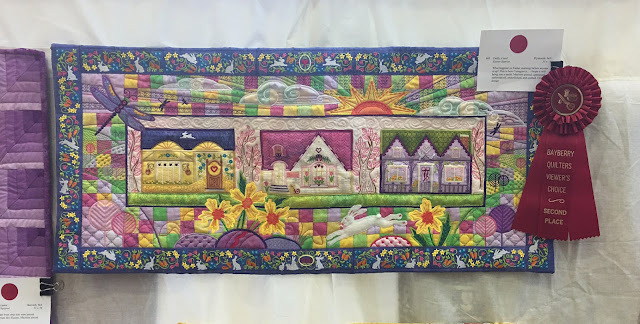 I needed a bigger piece- that was the inspiration for my bunny border! While fun to design, the border fought me in construction--- there's at least 6 yds. of extra bunnies hopping on my design wall. I learned that if you need a mirror image of something, rotating it 180 degrees does not do it, and was reminded of that quite a few times! 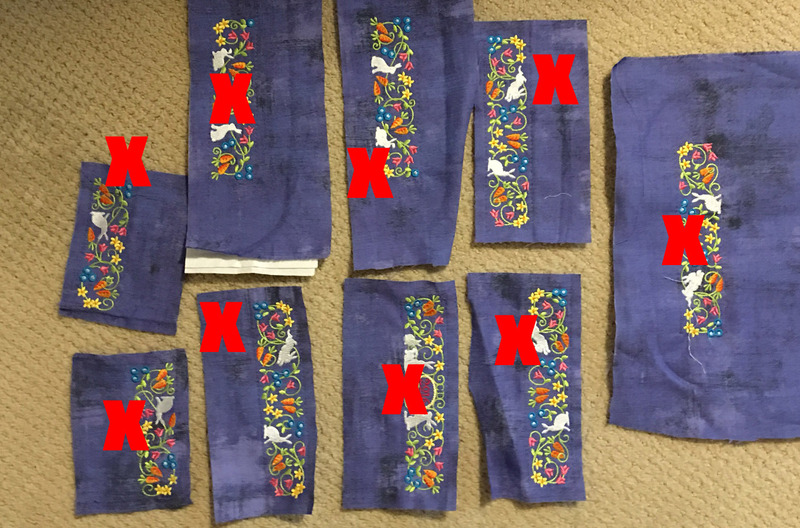 The borders also had to fit perfectly-- I had no idea how much shrinkage was going to occur with a piece this heavily embroidered, so more restitching. Of course, I finished just a day before it had to be at the show-- tired, but very, very excited! Every inch of this piece has been fully embroidered--how many completely digitized and hooped pieces are in these quilt shows? I haven't seen many-- maybe it's because no one else is crazy enough to do it!